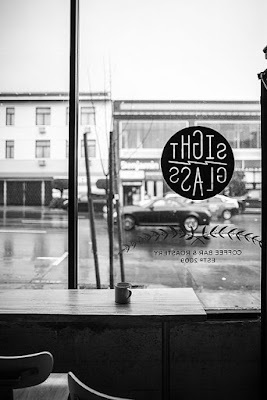 GUEST BLOG / By Jerad and Justin Morrison, owners/founders of Sightglass Coffee/Roastery, San Francisco--Ok, so that took a little longer than we thought. Back in the heady days of 2014, when we were still young and dangerous, we signed a lease on a former produce market on the corner of Divisadero and Page. After literally rebuilding from the foundation up, we opened our new store on July 28, 2017. In some ways this is where we always wanted to be. We were living right up the street on Laguna when they got Sightglass off the ground back in 2009. We had looked at spaces along Divis at the time, but nothing was quite right, so we put the idea in our back pockets. Instead, Sightglass opened in Soma, the Ferry Building, the Mission and at SFMOMA, and, as the song goes, the wheel in the sky kept on turnin’. Which brings us to today. Honestly, this space is special to us. We’ve been working with some of the same people to build our stores since the very beginning (we’re looking at you Rainbow John) and they’ve struggled with us over the perfect angle for banquette seating, looked at too many plaster samples, and told us yet again that we can’t afford a neon sign. (Yeah, we finally got one anyway.) They’ve been to our weddings and shared a few Hamms. These are amazing craftspeople, and they’re working at the very top of their chosen trades. We couldn’t do it without them. The woodwork, most of it milled from a single Monterey Cypress tree, feels like the soul of the project, but the metalwork, tiling, even the plasterwork, are all careful custom work. We uncovered original windows with intricate four-by-four panes, and had the original frames remade, using mahogany that should last a hundred years. The plaster is hand-troweled and the mirror frames in the bathrooms (along with all the other pieces of metalwork) are custom fabricated. It’s an incredibly carefully designed space, but it feels warm and fuzzy, happy and hopeful. We also have a walk-up window! We’re still not sure exactly why it feels so amazing to buy coffee from a window on the street, but trust us on this one. We have a special menu available that’s designed for faster service; this is a major crossroads with three bus lines within a block and the Wiggle right up the street, and we want to put a cup of coffee in your hands and get you on your way. We have our full menu available inside, with cold drinks, including cascara shrub, vanilla cold brew, and a few others, all on tap. We have pastries from Neighbor Bakehouse, b. patisserie, and Piccino. We have comfortable banquettes, a community table where you can meet friends, and benches along Page Street where you can read, or talk, or just look at your phone for a while, like a normal person. We have the best neighbors. Over the years we’ve had a few beers at The Page (and spilled a few on the Coral Parfait carpet), got our Tintin fix at Comix Experience, and coveted the vintage egg cups at Cookin’. We’re also joining a group of businesses — Nopa, Bi-Rite, The Mill, 4505 Meats, and many, many others — who have genuinely changed the way that San Francisco eats and appreciates food. Their thoughtful, honest, quality-driven approach is an example and an inspiration. We’re here Divisidero and Page. We can’t wait to see you. We want to give you coffee. We want to be your new friend and not in a weird way where maybe you make plans to go indoor rock climbing but then realize half-way through that you have nothing in common. We want this to be chill, and happy, and to serve you some of the coffee that we talk about all. the. time. Seriously, we talk about coffee constantly. Which makes sense, because we love it. And we love you. Come see us on Divis.